We are a prominent firm engaged in manufacturing and supplying Inspection System Products. These are designed with utmost precision by our experts using advanced machines and equipment at our premises. Post production, these products are tested on varied parameters by our professionals to ensure their flawlessness. Some of the acclaimed features of the products are long functional life, easy installation, low maintenance, dimensional accuracy and high performance. We are engaged as one of the well-reckoned Manufacturers, Exporters and Suppliers of Vial Inspection System. Our Vial Inspection Systems are widely used in many industries for accurate quality checks and our clients have always given a positive feedback regarding them. Vial Inspection Systems can be availed at market leading prices by us. To identify any foreign particles, dust, glass particle, small creatures etc. in bottle/vial after washing process. To check filling level of Liquid or Powder in bottle/vial. To check presence/absence of cap/seal on the vial and also to check a position of the cap. To verify Presence/Absence of the Label on Bottle/Vial. To verify Label pattern matching and color matching. To check and verify OCR, Barcode, Pharmacode, 2D code on Label. This OCR contains the detail of the product like Batch no., M.R.P., Manufacturing. date expiry date etc. It is the totally customized solution according to different application and products. The system is having Software for making a decision according to pre Defined Criteria. We have VISION PHARMA PLUS software. The software is designed especially for Pharma industries. Camera, Optics, and Illumination are used mainly for grabbing an image of moving an object on the conveyor belt at high speed. Then camera transfers image to the Industrial PC(I-PC). The sensor is used to synchronize vision system with the machine. There is software in the I-PC, which processes and inspects a particular image of the product/object and checks that inspection criteria are fulfilled or not. If a product fails to fulfill pre-defined inspection criteria, Software generates Rejection signal and transfers that signal to Rejection system so that product is rejected and stores values or images in report file which can be rejected. Rejection System may be Air based or Piston based, depending upon weight and dimension of the product. On receiving rejection signal, rejection system rejects/sorts particular defective product from the production line. 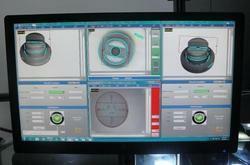 The Vision System is used in a Production line for the 100% quality assurance. It inspects for a visible defect in the product at high speed. Vision Inspection is completely replacing Manual inspection using higher accuracy and higher speed compares to Manual Inspection. Machine Vision System is PC-based Industrial Automation that is used for 100% Quality Assurance at very high speed. Machine Vision System is throughout consistent during the work. 24 Hours availability without failure. Closed loop control with maximum accuracy. Plenty of data saving and fetching. Very low maintenance cost and handling charge. Identify common faults emanating from the production and automatically reject the defective components. Widely Used in Printing Industry. Vision Systems check & Verify the Registration mark for Color Intensity, color Presence, Color Shifting and accordingly it identifies the color quality and shifting of the printing in whole Sheet/Paper/Carton/Label/etc.